Offer persons 55 and older the opportunity for​ independent living in a faith-affirming community. Location - Come for a visit and you will want to stay! ​ The Whitlock is governed by a Board of Directors that includes members from supporting United Church of Christ churches and Bremen community representatives. Whitlock employees: Administrator, Steve Wirgau, who oversees daily operations and facility maintenance; Cindy Leonard, Melissa Leonard, Heidi Willis, kitchen staff; Jane Huff, housekeeping and activities. In addition, many dedicated volunteers and friends help to carry out the Whitlock mission. ​for independent living in a faith-affirming community. 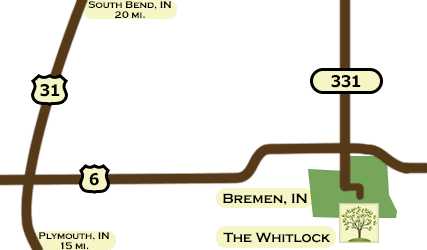 The Whitlock is operated by the Michiana Benevolent Society, a not-for-profit organization of 12 United Church of Christ congregations in North Central Indiana from whom it receives charitable and membership support.